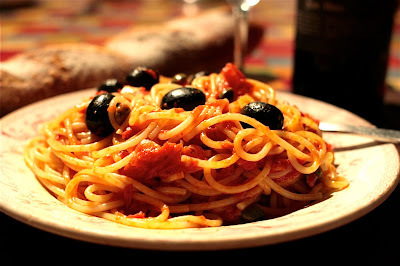 Italian food has a wonderful variety of different regions and styles. In my travels, I have learned to appreciate the delicacy and subtlety of the various regional cuisines. This is one of those recipes that reflects true home style Italian cooking of Rome. The loose translation of this dish is, “spaghetti in the style of a prostitute". I don’t know exactly why it has this name, but I have heard that it was a quick dish to throw together, and as such it was popular with the “ladies of the evening”. 2- 28 oz. cans of crushed Tomatoes, or whole tomatoes that are lightly chopped in the processor. San Marzano’s are the best. Parmesan Cheese or non dairy cheese substitute to keep it vegan. Serve over penne, bucatini or spaghetti. Top with Parmesan cheese.